The president of Motorola Mobility China has traveled to Nanjing to meet with employees who continue to protest after being let go during a round of layoffs by its new parent company, Google. Protests in Beijing, the nation’s capital, have largely died down, however, as Motorola reports that 90 percent of dismissed employees have signed agreements ending their contracts. Beijing News reports that more than 400 Motorola employees continued to demonstrate outside the Motorola offices in Nanjing, as of Monday, August 20. A spokesperson for the company has confirmed that Greater China president Frank Meng is currently meeting with employees there. An employee who had reportedly worked for Motorola for three years told reporters that the protesters’ are appealing for the Nanjing Software Center to be kept open, as there would be too few job opportunities for all 500 employees if they are let go. Google and Motorola announced the job cuts last week, noting that 4,000 staff would be cut and one-third of its 90 offices would be closed. An SEC filing revealed that Google, which completed the $12.5 billion acquisition in May, expects to lose $275 million in the restructuring. Google also closed the Motorola office in Israel earlier this week, letting its 30 employees go. 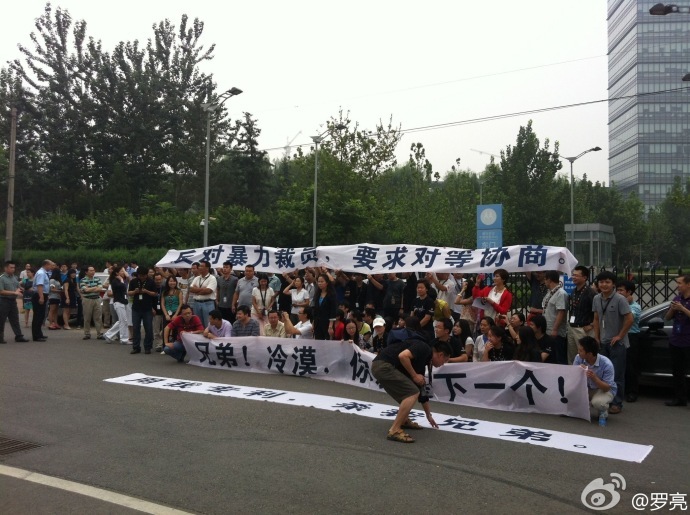 After Motorola’s China division confirmed the layoffs, employees in both Nanjing and Beijing began protesting the decision. In Beijing, Motorola extended a deadline that required employees to sign walking papers and has reportedly indicated that it will not unilaterally terminate the labor contracts of staff who have yet to sign the agreement. 90 percent of the dismissed employees in Beijing had signed by a deadline of August 21 at noon, QQ Tech reports. Motorola has also offered an additional one-time payment for housing subsidy assistance to some of its employees. That benefit would normally come into effect after three years with the company, but it had yet to be activated for employees since Motorola Mobility was spun off from parent company Motorola less than two years ago. Some of Motorola’s competitors are using the layoffs as a hiring opportunity and have extended offers to the company’s former employees. According to the Nanfang Daily, Lenovo, Xiaomi and other companies have extended an “olive branch” to those looking for work. One former employee told the paper that he had looked into working for either Sony or Xiaomi, but decided to go with Sony because Xiaomi’s engineers are known for working 12 hours a day, 6 days a week. Update: Local media are reporting that, as of Wednesday, 500 Motorola Nanjing employees have refused to sign papers terminating their employment contract. Meanwhile, in Beijing, all but one worker have reportedly signed.